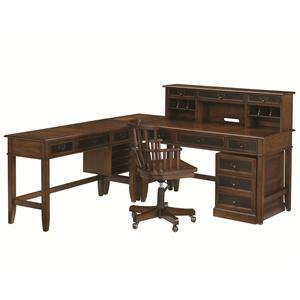 Give your home office the ultimate traditional old-world touch with this complete L Shaped Desk and Credenza set. Made up of a desk, credenza, hutch, corner table and rolling file, you'll have plenty of space for all of your home office needs. 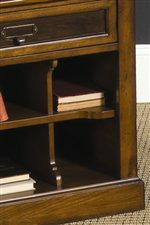 The desk features three front drawers with a drop down keyboard tray, while the hutch includes three drawers, three open storage areas, six cubby spaces, and wire management. 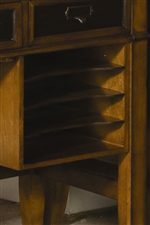 The credenza also features three drawers, a pull down keyboard tray, mouse pad, pencil tray, and paper storage areas. The corner table makes it possible to connect the desk and credenza file offering a place to set a lamp or plant. A rolling file then acts as a safe place to keep important documents with its lateral drawer and two additional drawers. Altogether the desk set is finished in a warm Whiskey finish with antique hardware. 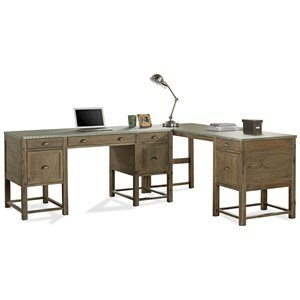 Simply a fantastic desk set to give your home office that old-world, traditional vibe. 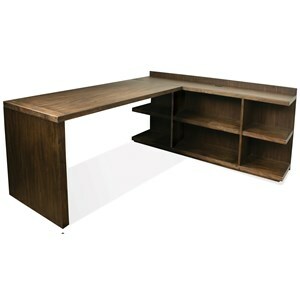 The Mercantile L Shaped Desk and Credenza by Hammary at Stuckey Furniture in the Mt. Pleasant and Stuckey, South Carolina area. Product availability may vary. Contact us for the most current availability on this product. 050-943 Credenza 1 52" 20" 30.75"
The Mercantile collection is a great option if you are looking for Casual furniture in the Mt. Pleasant and Stuckey, South Carolina area. 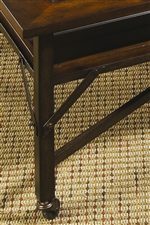 Browse other items in the Mercantile collection from Stuckey Furniture in the Mt. Pleasant and Stuckey, South Carolina area.